The food of Galicia | Where in the world are the Uricks??? I had heard about the amazing food in Galicia long before we even planned this trip. We have not been disappointed! Walking through the market one sees an abundance of freshly caught fish, beautiful beef, lamb and pork and so many different types of cheeses and sausages! Oh! and chocolate, pastries and cakes that are found in the Pasterias! And then there is the olive oil and the wonderful wines! One of the specialty cakes is the St. James’ Almond Cake which is decorated with the St. James’ Cross. Another fabulous thing in Santiago DC is that a complimentary plate or two of tapas are served with first drink order. Outside the market this delicious looking octopus (pulpo) was being cooked in a large tub. It was served on the little wooden plates by cutting into bite size pieces, seasoning with salt and pepper and then drizzling with olive oil! I wanted it so badly, but we were going to have a delicious lunch and I couldn’t spoil my appetite! Ps. I found some on the road to Salamanca and we had it for our picnic lunch! 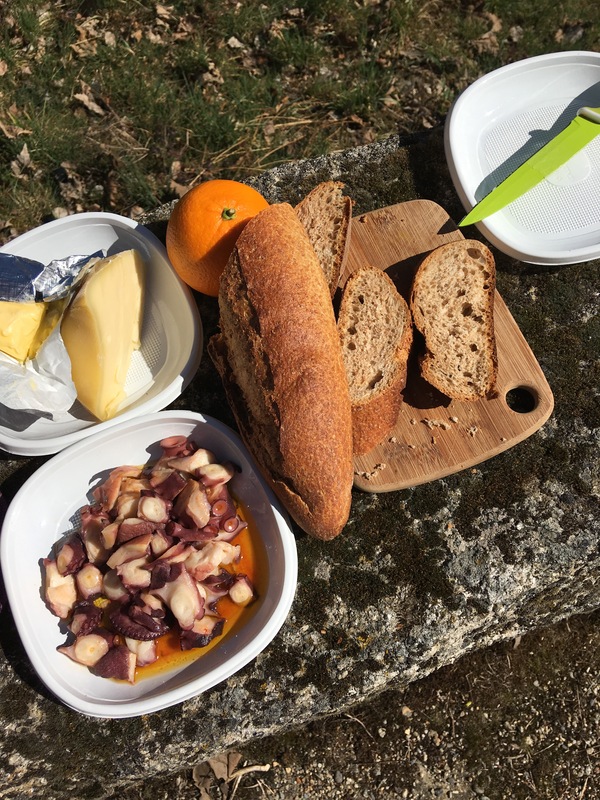 Our picnic of pulpo, cheese, bread and wine! We lingered over an amazing lunch at O Curra da Parra. This entry was posted in Cooking, Eating Out, FOOD, Markets, Spain, TRAVELLING. Bookmark the permalink.